I now have it working. Thanks for your assistance and support. Ok Shane, we have found the solution, now that works well. My first question is what speed CPU is required to run v0.4b/S2-1600/WinXP? I cannot answer easily. If your graphic card is a card that had already hardware mpeg2/H264 decoder you can use a low power CPU. I use a very low power miniITX motherboard ( $85, complete motherboard including CPU, GPU ) with atom525 processor running at 12volts-25Watt than can decodeMpeg2 and High Defintion H264 without problem. If we suppose that TS packets have little sliding values between PCR and presentation time stamp (PTS), at about 20 sec PTS has a value less than PCR, so the TS demux discard packets and freeze , waiting for good PCR/PTS accordance. If you use a low cost set top box that don't take care of timing, it will continue to show video and audio, if you use professional DVB receiver that check for best synchronization, it will freeze, if you use Microsoft DTV demuxer ( with Tutioune or other software) it will freeze due to your bad PCR/PST values. As you are freezing only after 20sec I think that this is a better reason than your PC power. You can send me a sample of 30sec of your TS ( from TS source or recorded with Tutioune) and I will analyse it. I think it can be why your PC freeze only after about 20 sec. One other thing that can happens is the lost of some packets, but you can detect that looking at "received packets" and "overtaken" packets. I cannot see on your snapshot. Yes I have to create a PDF manual that could be better for reading and printing. My good news is that I have stopped the video from freezing while using Tutioune v0.4b with S2-1600. I purchased a used Dell Optiplex PC with WinXP on eBay that has a 3.2 GHz dual processor. Now when Tutioune runs, the processing consumption is only about 40% - easy. You may remember that my older installation with 1.8 GHz P4 would run about 80%, but easily hit peaks of 100% CPU and the video would freeze. 1.8 GHz P4 with WinXP was too slow. 3)	The bottom edge of video seems to be alive with flickering artifacts of “something”. 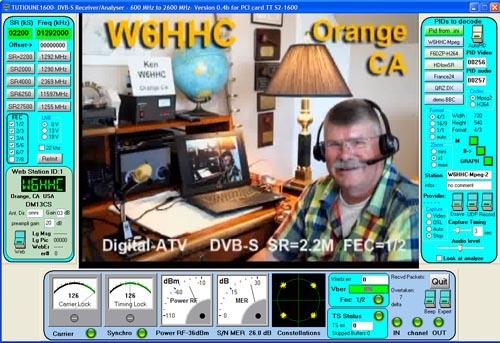 BTW...congratulations on your efforts to help the HamTV team capture ISS DATV video. Well done!! If you are using Win XP there are no Mpeg2 video decoder at XP installation. so we must install some "codec filter" and there are many mpeg2 decoders that exist and can be installed. you have almost one installed and chosen by windows as you can see a picture and the Tutioune Graph led is Green. tell Windows to chose anther Mpeg2 decoder that fit well. To understand what could happens in your computer, I have added an invisible function in Tutioune that create automatically a file called "Newdecod Mpeg2.grf". This file show which Mpeg2 decoder has been chosen by WinXP. You can read this file with GraphStudioNext. Send me this little file and I will analyse it. The second thing that you will have to do is to tell winXP to chose another Mpeg2 decoder. So be sure to have another Mpeg2 decoder and the good one. You will need to use DSFMgr for that. 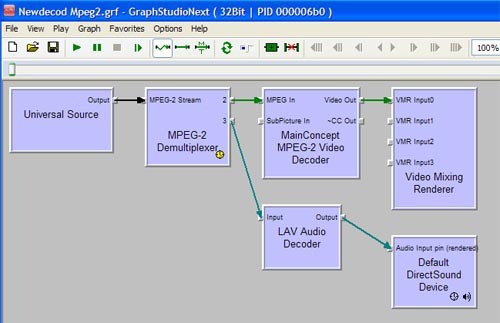 I will tell you how to do that, when you will have downloaded these tools ( DSFMgr and GraphStudioNext) and sent me your "Newdecod Mpeg2.grf" file you will find in Tutioune directory. * TS packets received are sent by Tutioune in the Universal Source Filter. ( usrc.ax) These are packets of data that can content one or several video and audio channels mixed. * The Universal Source Filter send the data stream to a Microsoft Mpeg2 Demultiplexer that will separate audio and video data that are in the stream and chose only for output the audio PID and video PID you have selected in Tutioune. * the demux audio output is coded in Mpeg1 layer2= mpegaudio, we need a decoder before sending the data to the sound card. Here Windows has chosen the LAV audio decoder. * the output of the audio decoder is a decoded audio stream that is sent to your Soundcard by the Audio Renderer: "Default directSound device"
* The demux video output is coded in Mpeg2 so we need a decoder, we see that Windows has chosen the LAV video decoder. We first try to tweak better your LAV video decoder. try now different setup . Restart Tutioune after each change. If you don't find the link called "LAV Video Configuration" in the menu, you can create it. right click on your windows Desktop. and create a link that you will name "LAV video Configuration"
and put the 2 sentences for "Target" and "Start in:"
Start in --> "C:\Program Files\LAV Filters\x86"
You will obtain a shortcut that will open the Video configuration utility. Last edited by F6DZP on Thu 13 Mar 2014 18:56, edited 2 times in total. Thank you for your guidance. Some small differences between our languages did not allow me to immediately recognize that "LINK" == "SHORTCUT" in "windows talk". But soon it was apparent that windows SHORTCUT was the intention of your instructions. Now, I can see the same tool as you can. The Hardware Accelerator field was set to NONE. Also "available" was DXVA2 (native) and DXVA2 (copy-back). 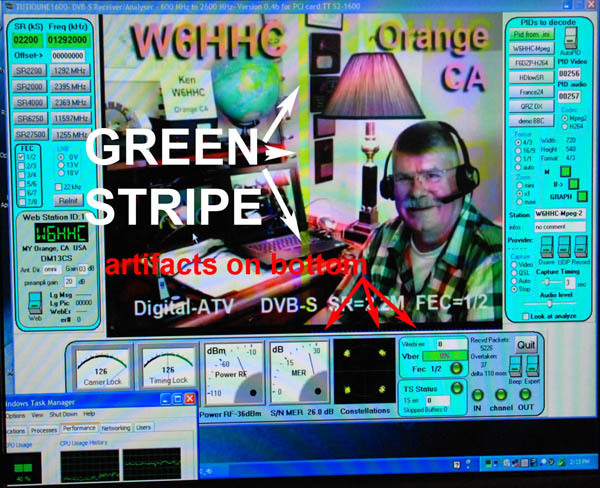 There was NO CHANGE in the video "green stripe", etc....when I change to DXCA2 (native). However...I do see about 4 seconds of additional latency if I choose DXCA2 (native) instead of NONE?? BTW - in an earlier part of this thread, you requested that I should download and install DSFMgr. The only place to download this file that I find seems to be http://www.softella.com/dsfm/index.en.htm ...is this a good location for me to download? SUCCESS with Tutioune with installing S2-1600 at last! !....on my e-Bay Dell OptiPlex model GX620 PC. Thank you for your patience with me and your guidance. The MPEG-2 CODEC from MainConcept was successful with very nice video rendering. As you can see in the screen-capture below, the video displayed by Tutioune is now very good...no issues....from my DATV-Express station. I am convinced that if I had a "plug-in GPU card" instead of just an Intel on-motherboard video--chip-set, I would have avoided so much trial-and-error. But I thank you again for your guidance. Finaly we have found a codec that fits well with your Intel GPU. Tutioune works well and DATVExpress too.